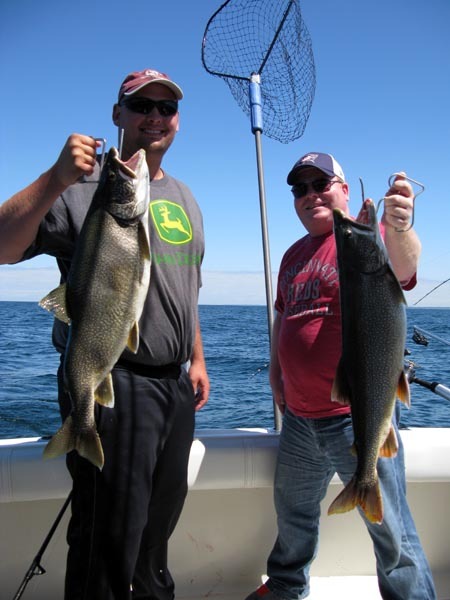 We fished south of Ludington today. The west wind made for tough trolling. It was hard to keep the boat straight and maintain a good speed. 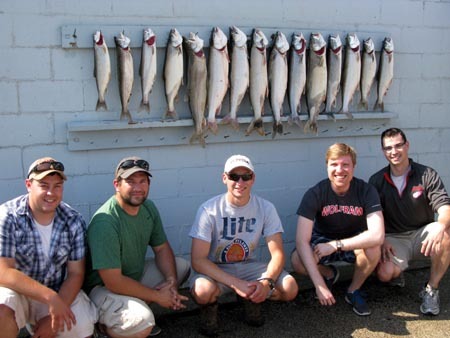 We fished between 70 and 110 feet of water. We started in 70 and the bottom temp was good but later in the morning the water warmed and we had to move out deeper. Our wire divers fished on or near the bottom took most of our fish today. Our dodgers/spin-n-glos took a couple more than our 8″ Chrome Spin Doctors/WhirlyGigs. Good fishing again today. No doubles or triples but the action was steady. After losing the first 2 fish our crew didn’t lose another one that hooked up. 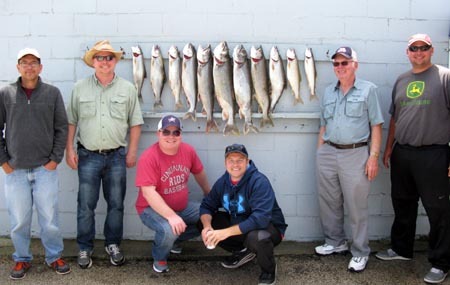 We fished south of Ludington between 70 and 90 feet of water. Our wire divers fished on or near the bottom were once again our hot rods. 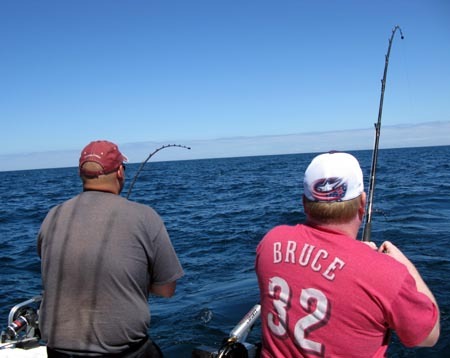 We took 2 fish on a rigger with a set of silver cow bells and a blue & silver Spin-N-Glo. Three fish came on a high wire diver with a chrome dodger/yellow Spin-N-Glo. The rest of our catch came on 8″ Chrome Spin Doctors with either a Spin-N-Glo or a Dreamweaver WhirlGig. I’m really likening the WhirlyGig. It seems to ride just a little higher than a Spin-N-Glo and doesn’t get as weeded up as they do.